Founded in 1872, Bury Town Football Club is one of the oldest Football Club’s in the country and has a proud history dating back over 130 years. The club was founded by Mr William Lake at a meeting in the Suffolk Hotel. The original name of the club was Bury St Edmunds FC and the first committee of the club elected to choose royal blue as the club’s colours, and therefore the club has been nicknamed the ‘Blues’ for its history. The club took up residence at Kings Road, also know as the Cemetery Road ground, in 1888. Kings Road was the first football ground in East Anglia to operate floodlights when on Monday 12th January 1953, the Blues played their first ever floodlit game against Cambridge City in front of 2,105 spectators. A total of 14 bulbs of 1500 watts illuminated the Suffolk skyline for the first time and history was created. The lights were financed by the Bury Town Supporters Club. A notable player for the club in the early days was Reginald De Courtney Welch who appeared a defender for Bury St Edmunds in 1877. De Courtney Welch was a member of The Wanderers side that successful won the first ever FA Cup in 1872 and he also played in the first ever official international match for England, against Scotland in November 1872. The club was one of 11 founder members of the Suffolk County Football Association in 1885 and had won the Suffolk Premier Cup on 9 occasions. The clubs name was changed by a vote to Bury Town in September 1885, however 10 years later the members chose to adopt the full name of the Town back as the name, before changing to Bury United in 1908. In 1923 the clubs members decided that the name ‘United’ was no longer appropriate as there were a number of sides in Bury St Edmunds, and decided to revert to Bury Town, which has remained to this day. The club played in various local leagues until 1935 when it became a founder member of the Eastern Counties League. The club spent a total of 22 consecutive seasons in the Eastern Counties League, finishing as runners up in 1937-38. The Blues claimed the ECL title in the 1963-64 season as part of an historic treble, as they also captured the ECL Knockout Cup and the Suffolk Premier Cup. This success saw the club move to the Metropolitan League and they kicked off their first ever game against Charlton Athletic ‘A’ at Kings Road in front of 1,150 spectators, Bury running out 1-0 winners. The club finished 4th in their first season and also retained the Suffolk Premier Cup. Season 1965-66 was another successful season and another treble haul of trophies as the club stormed to the Metropolitan League title, won the Metropolitan League Cup and the Suffolk Premier Cup again. By this time the club were averaging over 1,000 supporters at their home matches and interest in the club was at an all time high. In 1968, the Blues reached the First Round Proper of the FA Cup and drew Third Division side Bournemouth & Boscombe at Kings Road. 3,000 spectators assembled and witnessed Bury hold the Football League side to a goalless draw. The replay saw Bournemouth win through by 3 goals to 0 at Dean Court. The season had further success when the Blues won the Metropolitan League title for a second time. 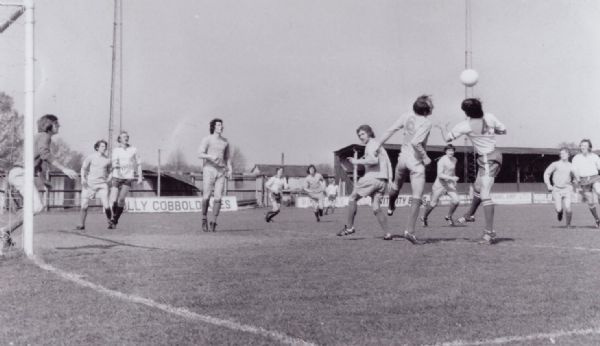 The clubs success resulted them taking the bold step to join the Southern Football League for the 1971-72 season. The club struggled to adapt to their new surroundings and after five seasons, decided to take the decision to re-join the Eastern Counties League, a decision that proved unpopular with supporters. On Wednesday 28th April 1976, Bury Town played their final match at the historic Kings Road ground when West Ham United were the visitors. 1,750 watched on as the sides drew 2-2, and a pitch invasion signalled the end of the Blues spiritual home. Bury Town moved into their current Ram Meadow ground in 1978 and collected the Suffolk Premier Cup as a reward. The Blues spent a total of 11 seasons in the ECL and their greatest moment came in their final season when the reached the 4th Qualifying Round of the FA Cup and were drawn away at Football Conference leaders Enfield. The sides drew 0-0 at Southbury Road and returned to Ram Meadow for the replay, however in front 2,500 supporters, the visitors sneaked home 1-0 to reach the First Round Proper. The 1987-88 season saw ambition retuned to the Town and Bury were promoted to the Southern League, leaving their ECL rivals Braintree Town and Sudbury Town behind. Both clubs would later elect to follow in the Blues footsteps. After a few seasons of promising results and large home crowds, the Blues failed to reach the Premier Division, the closest they came was finishing 4th in 1988-89. Years of overspending on players and ground improvements finally caught up and the club drifted into decline as the crowds drifted away. On the 4th May 1996, the Blues were relegated at Redditch United from the Midland Division of the Southern League, back to the Eastern Counties League; a Suffolk Premier Cup final victory over Woodbridge Town was the only thing to cheer up the supporters. The club was however in severe financial difficulty and supporters were relieved to see football at Ram Meadow in 1997. The club spent another 10 years in the ECL, and despite some early seasons of struggles, success coincided with the appointment of former Colchester United captain Richard Wilkins to the manager’s seat. The club reached the Quarter Final of the FA Vase in 2005 and then the Semi Final in 2006. Crowds rose back up and after two consecutive runners up spots in the Premier Division of the ECL, the club were promoted to the Isthmian League for the first time in their history. The stay lasted two seasons and after adjusting to a higher level in 2006-07 with a 17th place finish, the following season saw the Blues finish in 7th position. The FA re-organisation in 2008 saw Bury moved into the Southern League for a third spell of membership. A successful campaign saw Bury finish in 7th position in the Midland Division table, reach the First Round Proper of the FA Cup, losing 4-2 at Alfreton Town, and reach the Semi Final of the Southern League Cup, however in 2009-10, Bury Town clinched the Southern League Midland Division Championship on the final day of the season with a 3-0 home victory over Marlow in front of 1,550 supporters. The Blues pipped Hitchin Town to the title, scoring 115 goals during the campaign and collecting 102 points to gain promotion. Another move across the pyramid saw the Blues re-join the Ryman League for the 2010-11 season, entering the Premier Division for the first time in the clubs history. Bury's first season in the Premier Division saw them in contention for the championship right up until the final few weeks, when defeat at Sutton United saw the title go to the Surrey side. Bury finished 3rd in the table but exited the play off's at the Semi Final stage. There was however silverware for the trophy cabinet as Bury collected the Suffolk Premier Cup, defeating Needham Market 2-0 at Ipswich Town's Portman Road. 20011-12 saw the club lift the Ryman League Cup with a victory over East Thurrock United and again finished in the play off places, but lost out to AFC Hornchurch in the Semi Final. 2014-15 saw our spell in the Premier Division come to an end after 5 years with relegation to Division One North. Our first season back in Division One North ended in a 13th place finish.